"The crowd gave Ali a standing ovation and chanted 'Ali, Ali' as the cart made its way to the pitching mound to deliver the opening ball." Now, I admit I'm impressed with Castro's ability to survive so long despite so many enemies, but this goes a bit beyond Guillen's amazement at the dictator's longevity. I don't know as I'd call that respect but you have to be impressed. But to say you love Castro? In Miami, Florida? Are you just stupid, or insane? This is the same man who in a visit to Venezuela in 2007 shouted "Viva Chavez!" The man clearly has some issues with latin dictators, but that's just his opinion. 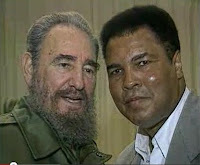 Its stupid to talk about politics as a sports guy anyway, especially to the point of complimenting Fidel Castro in Miami which is full of ex-Cuban patriots who despise the man. He's on suspension by the Marlins and Major League Baseball is examining the case. Look, Guillen has the liberty to say whatever he wants, and the baseball team has the liberty to fire him for saying incredibly idiotic things that hurt their standing in the Miami community. The problem is this isn't a one-time thing. Guillen is constantly saying stupid, self-destructive stuff. According to Dan Patrick, every time he gives an interview, Guillen says something so stupid he could be nailed in a report, but generally reporters don't say anything. And that's a problem. If the guy is so incendiary and idiotic that he has to have reporters continually protecting him, not only is he too unstable to have as a manager (and hence, front man for the team), but there's a serious problem with reporters. How much other crap has been covered for? Who else is saying crazy stuff they just don't report? Its one thing to shrug at a dumb slip once in a while, but someone who is continually spewing this nonsense? But the best coverage on this subject, as you'd expect, is from the Cuban interest blog Babalu. There, the blog team has repeatedly asked a simple question: why pick on Ozzie Guillen... and leave these others untouched? "Castro is very shy and sensitive, I frankly liked him and regard him as a friend." George McGovern after his first Cuban visit in 1975. Now Guillen is in a particularly specific situation as the Miami manager of a baseball-friendly bunch of Cuban exiles who long for freedom for their home, but Castro-love is all too common on the left, and people seem to shrug at it. And Babalu blog wants to know why on earth these Florida ex Cubans are so often registered as Democrats, given this situation.